The coat-of-arms for the von Seubert family gives a clue to the identity of this flamboyant sitter. With flowing hair and a loose informal striped silk robe de chambre, and matching cravat, he is presented in a grotto – a fashionably classical setting that alludes to the sitter’s taste and ideology. In his right hand he holds a scroll, in which an illuminated ‘B’ can just be seen, while his left arm rests on a classical column, and the corners of the composition are filled with an acanthus cartouche. It is a tantaslising code of presentation presumably carefully constructed by the sitter and artist, with a direct significance that has been lost over the centuries. The most likely member of the von Seubert family would be Johann Martin von Seubert (1626 – 1695). 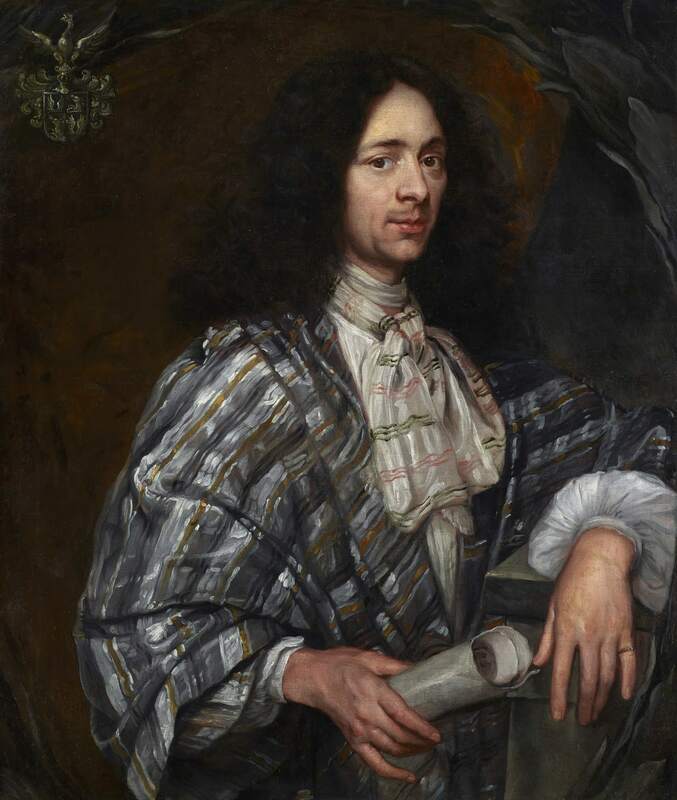 From 1654 Johann Martin acted as an agent in the French court for Duke Leopold Friedrich of Württemberg-Mömpelgard, and likewise represented other imperial estates in Paris, acting as a counsellor and foreign language secretary for the Duke Louis II of Bourbon. It is possible that the ‘B’ on the scroll seen here is for ‘Bourbon’, or alternatively, it may refer to his seat, Beutal castle, in Châtelot, gifted to Von Seubert in 1659 by Duke Leopold Friedrich. On 5 October 1666, Emperor Leopold I raised Johann Martin in the hereditary peerage, and it is plausible that Von Seubert commissioned the present portrait as a celebration of this elevation. That he would have commissioned a French artist to paint his portrait is consistent with Von Seubert’s French residence and connections to the Bourbon court. The fief was confirmed by his successor Duke George of Württemberg-Mömpelgard on December 13, 1671, with the additional loan of a nearby village, Bretigny, and the acquisition of a small estate at Echelotte.